Rooms from $60.35 per night. Description This Port Wentworth, Georgia hotel has an outdoor pool, free internet access, non-smoking guest rooms and free breakfast. With complimentary Wi-Fi and a seasonal outdoor pool the non-smoking Days Inn & Suites Port Wentworth - North Savannah provides loads of amenities at an affordable price. The low-rise Days Inn features 63 freshly decorated rooms and suites with microwaves mini-fridges coffeemakers and cable TV including HBO. Handicap-accessible rooms are also available. Free high-speed internet access complimentary weekday newspapers and a business center with fax and copy services help you stay connected. Guests can burn some calories in the fitness room and then cool off in the outdoor pool. The hotel also provides plenty of free parking. The Days Inn is off I-95 in the suburb of Port Wentworth about 20 minutes northwest of downtown Savannah. Area businesses within 10 minutes of the hotel include Peterbilt Trucks and Gulfstream Aerospace. The Savannah College of Art and Design is 20 minutes away and Georgia Tech Savannah is three miles away. Guests can view the exhibits at the Savannah History Museum before touring the elegant Owens-Thomas House both 20 minutes from the hotel. 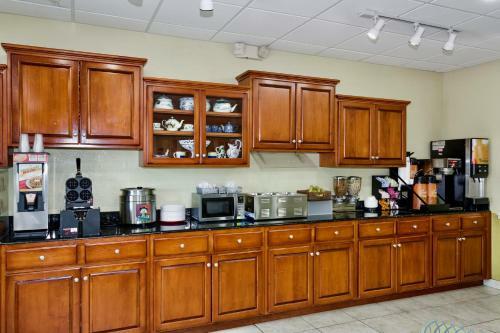 The Days Inn is seven miles from Savannah/Hilton Head International Airport. Add Days Inn & Suites By Wyndham Savannah North I-95 to your free online travel itinerary.